This article is about the microgame in WarioWare, Inc.: Mega Microgame$!. 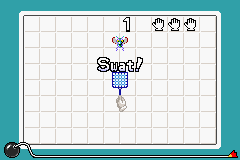 For the bonus mini-game also featured in WarioWare, Inc.: Mega Microgame$!, see Fly Swatter. For the original Mario Paint mini-game both "Fly Swatter"s are based on, see Gnat Attack. Not to be confused with Mario Paint - Flyswatter. Info Swat the irritating flies buzzing around you! Truly magic gaming! Mario Paint: Fly Swatter is a microgame found in the Nintendo Classics folder in WarioWare, Inc.: Mega Microgame$! which is based on the minigame Gnat Attack from Mario Paint. The player must swat the Big Fly when it is underneath the fly swatter. This page was last edited on December 26, 2018, at 01:23.